In August 1998 Wizards of the Coast released a poker deck box which includes two complete poker decks plus two advertisement cards which promote other Magic products. The decks each consist of 52 standard playing cards plus 2 jokers for a total of 54 cards and can be distinguished by their different backsides, red and blue. 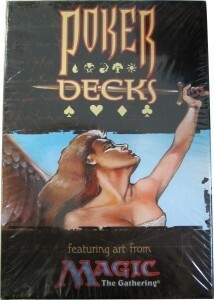 Additionally each deck features its own set of original Magic card artwork for the character cards.